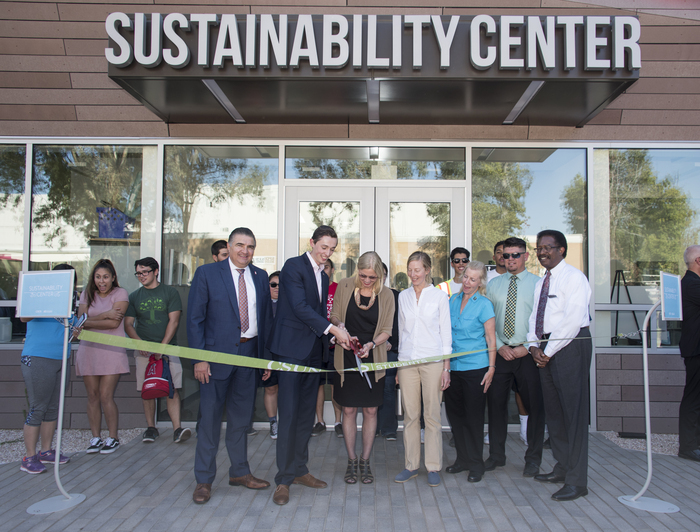 President Dianne F. Harrison, along with AS President Jonathan Goldenberg and state Assemblyman Dante Acosta, cut the ribbon at California State University, Northridge's Sustainability Center, the first in the CSU. File photo by Lee Choo. California State University, Northridge has updated its 2017-18 annual Sustainability Plan and noted some extraordinary accomplishments. CSUN is committed to creating a sustainable college environment by limiting its waste and combating climate change. Since CSUN adopted its sustainability plan in 2013, the university has decreased electricity consumption by 10.7 percent, decreased water consumption by 19 percent and increased its waste diversion rate from 20 percent to nearly 60 percent. Sustainability Center opened in October 2017. The center is the first CSUN building to earn a LEED (Leadership in Energy and Environmental Design) Platinum Certification, the highest certification offered by the U.S. Green Building Council. It’s also the CSU’s first “net zero energy” building, meaning the annual energy used by the building is equal to the renewable energy produced on site, and the first to reuse greywater — water that comes from sinks, bathrooms, kitchens and washing machines on campus. OnBase Usage, an online content management software, reached more than 1 million documents electronically filed by more than 20 CSUN departments — fostering a more paperless work environment. Sierra Center zero-waste project plans to reuse, recycle or compost all waste from the Sierra Center, including, but not limited to, the Freudian Sip, dining areas and Marketplace. The project is scheduled to launch this summer. Graduate students in CSUN’s Department of Urban Planning developed a “resiliency framework,” to promote sustainability for the area around campus, as well as surrounding neighborhoods. Campus utility dashboards online help Physical Plant Management staff monitor utility data for buildings and the campus as a whole. CSUN exceeded its green cleaning product purchasing goal. Ninety-one percent of all cleaning products used on campus are green cleaning products. Grounds crews started composting 100 percent of green waste on campus. The campus composting facility is processing more than 183 tons of landscape waste per year. CSUN launched its first bike share program, LimeBike. More than 10,000 people have tried the service, riding more than 30,000 miles since January. Campus officials drafted a zero-waste plan to bring CSUN to zero waste by 2025 — increasing the university’s trash diversion rate from 55 percent to 95 percent. An additional 50,000 square feet of grass was replaced with drought-tolerant native vegetation. This will help further reduce campus water consumption and exceed state water-conservation mandates.